Please note that all of our jewelry is hand made and one-of-a-kind. In that respect your order may differ slightly from the item photos on line due to differences in metal work, patinas, etc. We do not mass produce any of our fine jewelry therefore take these differences to be a "craftmanship seal." In the event that a piece is out of stock and requires a new build, we will notify you via email as soon as possible to give you an approximate ship date. 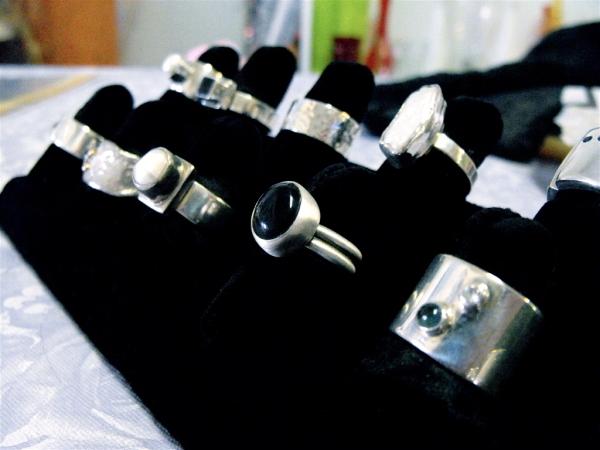 Custom Ring Sizes usually take an additional 3-5 weeks build time. We will inform you via email once we receive your order. Please be as accurate as possible as we cannot guarantee fit; we can only size according to your specifications. If the size is incorrect, we will re-size the item for you within 30 days at only the additional charge of shipping that we incur. Please obtain an Return Authorization before you ship back to us as we will not accept returns without prior consent. Thank you for your patronage and we look forward to serving you with an on-going relationship. If you have any questions at all please email us and a qualified representative, heck possibly even the owner, will contact you personally. DesignsByLeah.com: Copyright 2009 ATP Consulting, Inc.